On April 14th and 15th 2014 we held a holiday club at the church with the theme Easter and New Life. 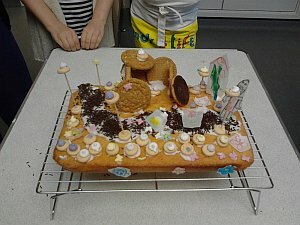 There were various Easter related activities culminating with a very special Easter themed cake. It was all enjoyed very much by the children who took part. More photographs can be found in our photoalbum. Saturday 2nd November 2013 2.30 - 5.30 for children 5 - 11 years. Report to follow. The theme of our 2012 summer Holiday Club tied in with the 2012 London Olympics and about 50 children each day had a great time learning more about the athletes and how their faith inspired them. Many children said their favourite activity was Archery which they enjoyed on the first day. On the second day the focus was on the Paralympics and the children had a go at Goal ball and sitting volleyball They also enjoyed singing, Scottish Dancing, cooking and craft activities. These were the two hottest days of the summer so we kept cool with lots of drinks and quieter activities but all had a very enjoyable two days. You can find many more photos of the week in our photo album. Watch this space for details of future holiday clubs. Sister Jenny Colby Holiday Club co-ordinator. 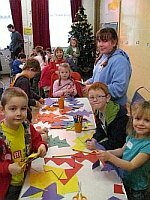 More than 50 children joined in the fun at Xpedition Force - 4 days of games, songs, cooking, crafts and workshops at Bracknell Methodist Church over the Christmas 2011 holidays. Our Xpedition Force took the children on an adventure around the World. 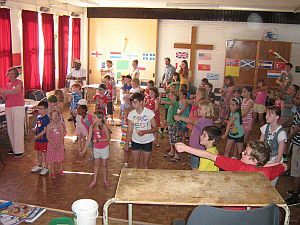 Over the 4 days the children had the opportunity to explore 4 different continents (a different continent each day) through arts and crafts, cooking, dance, musical instruments and singing. 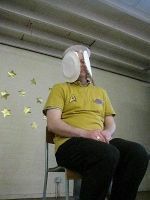 The holiday club also featured Showstoppers got Talent, as Xpedition force explored their gifts in a daily talent show. From singing to break dancing the children voted each day for their Finalist to perform in front of their parents. Our daily drama was Set in a world of snow, ice, and rock climbing, as our Xpedition Force team climbed a mountain, following the motto of Climb safe, climb high!. The team were looking for treasure as the children learnt about the Nativity through the five senses - Listening, Smell, Taste, Touch and See. 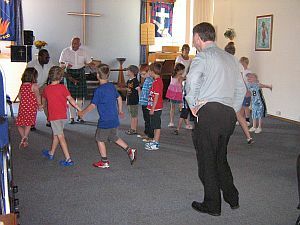 The photos of the children show they got really stuck into the activities and were full of enthusiasm all week. You can find many more photos of the week in our photo album. The week finished off with a special celebration for their families which included our Glee choir, the final of Showstoppers got Talent and our daily drama. Finally, We would like to publicly thank all those associated with the holiday club, whether they help during the week, prepare things beforehand or just support by their prayers. Three days of fun, learning, and journeying into space about sums up this years Starship Discovery Holiday Club held during the Easter holidays in 2011. The main hall transformed into scenes from outer space with stars and planets and rocket ship paraphernalia. The theme of Starship Discovery explored different aspects of what it means to be in space and included the Starship theme song each morning which celebrated God's Love. So what was the attraction? Maybe it was the ongoing drama of the Watt Family who found themselves lost in space and invaded by the terrible Tarragons. Or was it the team challenge each day? Then there was the chance of games out in the fresh air - and always popular were the times in the cooking and craft room, not to mention the drama, science show and firing rockets into the sky. 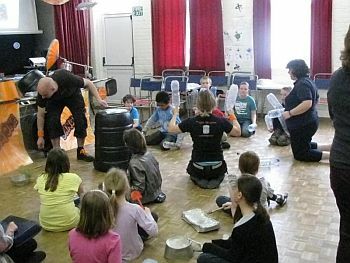 It was a memorable week and on the final day, Bang On who are an energetic junk percussion band who use a giant homemade drum kit to create funky beats treated the parents with the help of the children to a taste of their musical workshop. A large team of enthusiastic teenage and adult helpers ensured everything ran smoothly and safely over the four mornings of the club. Club leader and minister Robin Selmes says: "I have to say that I am 'over the moon' about the results. The children turned up - we had 55 children on the books and an average attendance of around 48 each day. There was a buzz and excitement every day. It was popular, so popular that some children asked to come along for more days than they had originally booked and some asked if they could bring their friends. It was a real community effort and the people taking part ranged from five years old to 80 years old so a big thank you goes out to all those who helped make this week such a success. The photos give a sense of the atmosphere of the Holiday Club which was much enjoyed by all who took part, helpers as well as 'space cadets'. You can find many more photos of the week in our photo album. "More to Christmas" was the theme for this year's Advent holiday club. The theme allowed us to unpack the gifts of Christmas : Story telling. Sharing, Caring and Light. It was great fun and a wonderful opportunity to get to know some of the children living in our community and who go to the nearby schools. 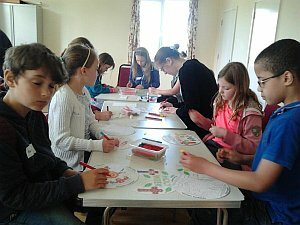 Throughout the week the children were very busy creating lots of crafts and playing games. We were privileged to obtain the services of Steve Price a full-time gospel illusionist and a member of The Magic Circle. They experienced a mix of comedy and illusions followed by an amazing balloon workshop. They learnt how to cook simple festive delights to eat over Christmas, from truffles to cheese straws. We discovered plenty of sweet tooths during that morning! 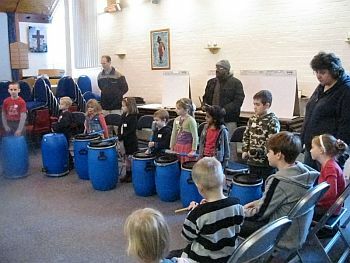 Using lots of recycled barrels which had been transformed into drums they experienced a musical workshop with a difference! We arranged for a junk percussionist to teach them the rhythm of life! .It started very noisy but by the end of the morning we think we had found a few budding musicians. At the end of the final morning we had a Christingle celebration. This involved a short drama, singing and lighting of their Christingles which they had made in one of the craft sessions and then this was followed by some party food afterwards. Lots of parents and grandparents came to see what the children had been doing and to support them at our this celebration. On our photo album you can find a few more photos to show you what the children (and leaders) were up to! Finally, a big thank you goes out to all the leaders and helpers, who gave up their time especially during this busy season and lovely wintry weather. We have over thirty leaders and helpers comprising the holiday club team. Well done to everyone concerned for the excellent team working and commitment shown! Showstoppers Holiday Club was held at our church in February 2010. This page was the publicity used at the time. Showstoppers was a very useful way of getting the Christian message to the wider young community and was enjoyed both by the children and by those from our church who helped during the week. A report on Showstoppers also appears on our News page and there is an extensive collection of photos in our photo album giving a sense of the atmosphere at the church that week. This February half term be sure your children have an action-packed week by joining us for 5 days of fun (Monday - Friday) at Showstoppers Holiday Club. The holiday club runs from 9.15am to 3.30pm every day at Bracknell Methodist Church, Shepherds Lane and is open to all children aged 7 - 11yrs (Yr3 - Yr6). 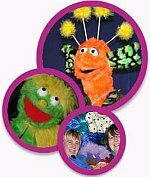 Throughout the week we plan to have LOADS of fun with games, crafts, activities, drama, and music. Alongside the workshops our Team from Pop Connections will be transforming the children into a pop choir and after an exciting week of rehearsals a concert is planned. 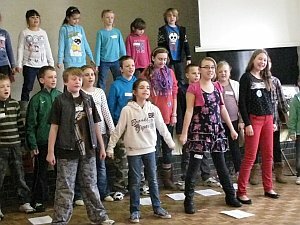 Parents, friends and relations will be invited to attend a vibrant performance of all their songs on the Friday afternoon. 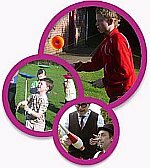 The Holiday Club is a sector project by Bracknell Extended Services and the Methodist Church. It is being launched at the main three junior schools in the Priestwood and Bullbrook areas: Sandy Lane, Holly Spring Junior and Meadowvale. To help with costs we do have to charge £10 per child for the week.